Use this eTool to randomly generate numbers to indicate the number of girls and boys in a family with three children. Janelle’s aunt and uncle have three children, two of whom are girls. Assuming that girl children and boy children are equally likely, Janelle thought that the chance of having two or more girls out of 3 children must be 50%. Janelle’s brother thought the chance of having so many girls had to be less than 50%. Randomly generate numbers to indicate the number of girls and boys in a family with three children. a. What do you think? Make a conjecture about the probability of having two or three girls in a family of three siblings. b. 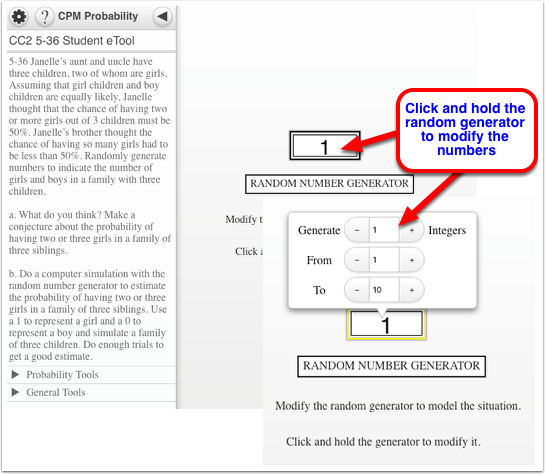 Do a computer simulation with the random number generator to estimate the probability of having two or three girls in a family of three siblings. Use a 1 to represent a girl and a 0 to represent a boy and simulate a family of three children. Do enough trials to get a good estimate.